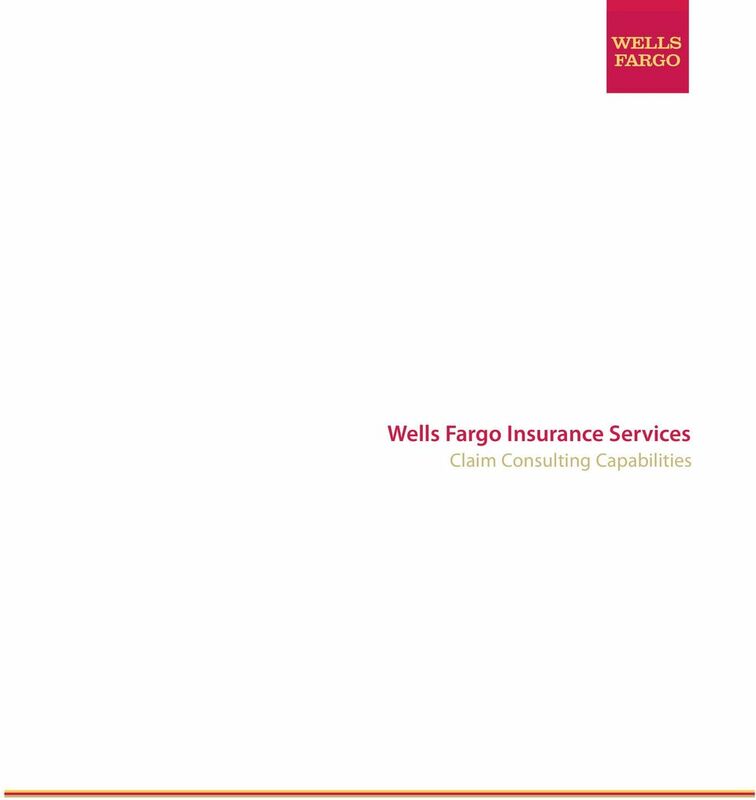 Download "Wells Fargo Insurance Services Claim Consulting Capabilities"
2 Claim Cosultig Claims are a uwelcome part of America busiess. I a recet survey coducted by Fulbright & Jaworski L.L.P., large U.S. compaies face a average of 350 pedig lawsuits. 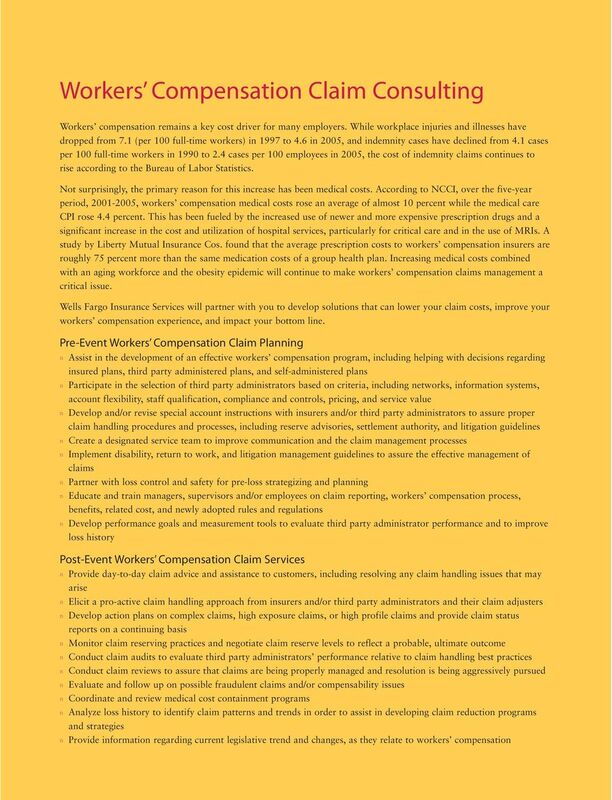 Regardless of the size of your compay, you will experiece claims either resultig from the actios of your employees, the actios of others, atural hazards, ecoomic, or regulatory factors. 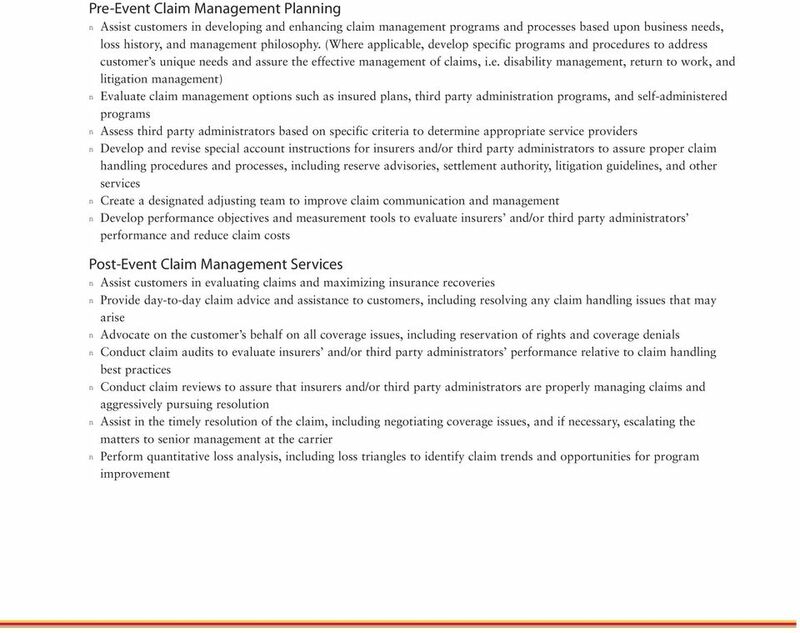 While loss cotrol programs ca help reduce ad mitigate claims, they will ever elimiate claims completely. 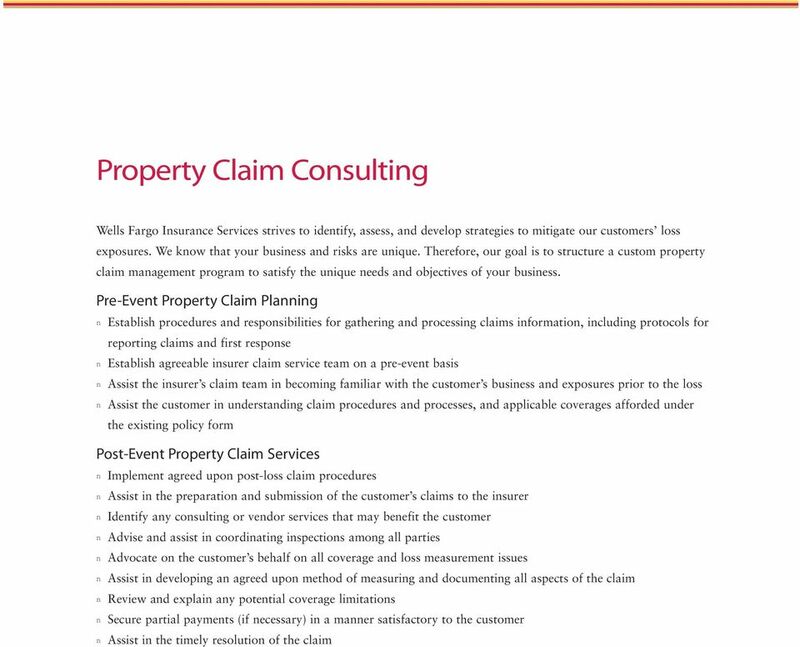 For this reaso, it is importat that compaies utilize claim maagemet practices ad have access to professioals with experiece i claim maagemet, ivestigatio, isurace egotiatios, accoutig, legal, ad claim loss aalysis. Without the proper claim maagemet processes i place, compaies ca suffer exteded recovery periods ad reduced recoveries, excessive legal ad direct claim costs, icreased isurace premiums, ad possibly deial of coverage. Wells Fargo Isurace Services has the people, as well as the kowledge ad experiece, ecessary to aswer difficult claim maagemet questios ad to assist our customers i developig effective claim maagemet processes from pre-evet to post-evet. Our Approach Wells Fargo Isurace Service s first goal is to uderstad your busiess, its uique exposures, ad your maagemet philosophy regardig claims ad risk. Secod, we use our experiece to work with you to tailor a claim maagemet program that satisfies your eeds. Successful claim maagemet begis before a loss eve occurs. I the pre-evet phase, we work with you to make sure the program is what you eed, ad i the post-evet phase, we work to make sure the program rus smoothly ad satisfies performace objectives. 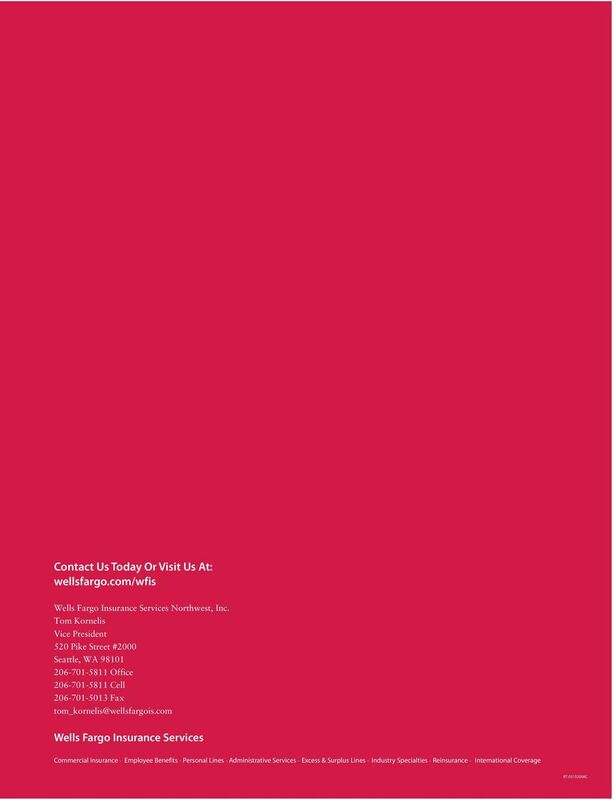 4 Liability Claim Cosultig Automobile liability Premises liability Products liability Fiacial ad professioal liability (D&O ad E&O) Liability claims make up what may Americas refer to as the ever expadig tort system. I fact, accordig to Tillighast- Towers Perri, the U.S. tort system will icrease by approximately $11 billio through 2008 to $280 billio. Today, tort costs equal $886 per U.S. citize, compared with $12 i With this type of growth, the questio becomes, How ca compaies better maage their tort liability? 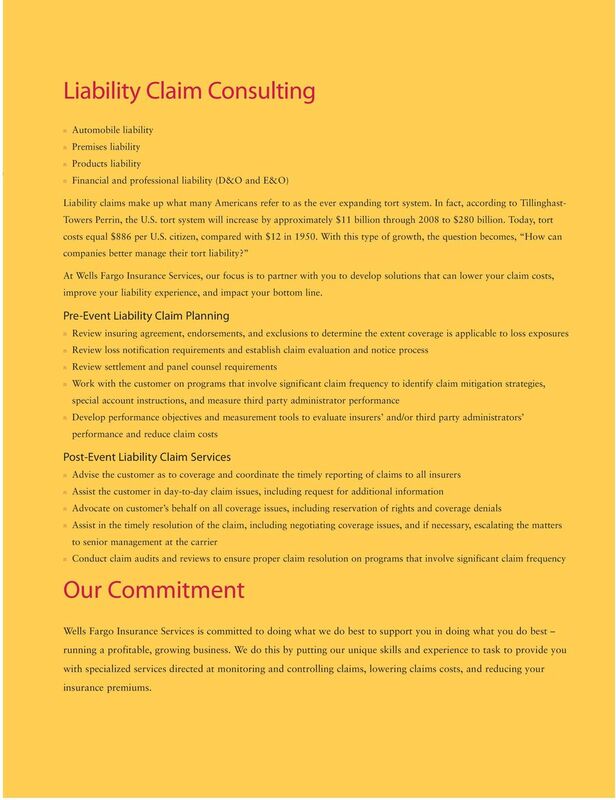 At Wells Fargo Isurace Services, our focus is to parter with you to develop solutios that ca lower your claim costs, improve your liability experiece, ad impact your bottom lie. Pre-Evet Liability Claim Plaig Review isurig agreemet, edorsemets, ad exclusios to determie the extet coverage is applicable to loss exposures Review loss otificatio requiremets ad establish claim evaluatio ad otice process Review settlemet ad pael cousel requiremets Work with the customer o programs that ivolve sigificat claim frequecy to idetify claim mitigatio strategies, special accout istructios, ad measure third party admiistrator performace Develop performace objectives ad measuremet tools to evaluate isurers ad/or third party admiistrators performace ad reduce claim costs Post-Evet Liability Claim Services Advise the customer as to coverage ad coordiate the timely reportig of claims to all isurers Assist the customer i day-to-day claim issues, icludig request for additioal iformatio Advocate o customer s behalf o all coverage issues, icludig reservatio of rights ad coverage deials Assist i the timely resolutio of the claim, icludig egotiatig coverage issues, ad if ecessary, escalatig the matters to seior maagemet at the carrier Coduct claim audits ad reviews to esure proper claim resolutio o programs that ivolve sigificat claim frequecy Our Commitmet Wells Fargo Isurace Services is committed to doig what we do best to support you i doig what you do best ruig a profitable, growig busiess. We do this by puttig our uique skills ad experiece to task to provide you with specialized services directed at moitorig ad cotrollig claims, lowerig claims costs, ad reducig your isurace premiums. A Valuable Tool to Uderstad ad Maage Your Compliace Risks The Uique Alterative to the Big Four Compliace is icreasigly beig idetified as a key risk withi a orgaizatio s eterprise risk maagemet (ERM) programs. A rejected. personal. injury case. needn t be. A write-off. Recoup the fees you thought you wouldn t see.